Despite preferring written to visual science fiction, I suspect I began with television sf. I suspect the first sf I encountered was The Magic Roundabout and The Clangers. Later today, the BBC will broadcast the first new episode of the later in forty years. Given the treatment of The Magic Roundabout, I am understandably nervous. That actually needs a bit glossing – the sf part of The Magic Roundabout was a film, Dougal and the Blue Cat, of which we had the album, the soundtrack cut to about sixty minutes. The Magic Garden comes under threat from the Blue Voice and her minion, Buxton, the Blue Cat, and the garden’s inhabitants are thrown into prison. Only Dougal evades capture, going under cover as Blue Peter (the Blue Dog) and is sent on a mission to the Moon… I never saw the film until it was released on video, but I did eventually get to see it on a big screen. It resonates through my unconscious. The Clangers, like The Magic Roundabout, was originally broadcast on BBC1. My memory is they came at the end of children’s television (Blue Peter, say) and before the evening news, but it clearly varied from week to week. 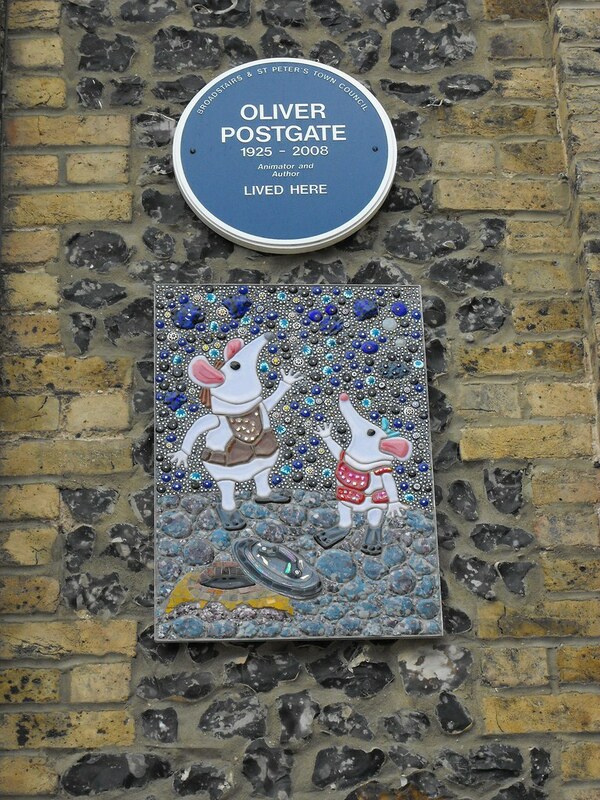 The creators, Oliver Postgate and Peter Firmin had been producing paper- and puppet-based animations since 1958 in a converted cowshed just north of Canterbury. The earliest Clanger appeared in Noggin and the Moon Mouse (1967), a spin-off book from Noggin the Nog (1959–65); the concept evolved into a species who live on a small planet, converting rubbish and debris into useful stuff. Firmin is still around, in his late 80s and I’ve occasionally seen him around, even sat next to him at a screening of The Clangers. His wife, Joan, is a bookbinder and artist, and they had six daughters, at least two of whom are artists (and Emily is the girl in Bagpuss). He still is active, as far as I can tell making limited edition linocuts and vinyl prints on an antique printing press. He was the creator of Basil Brush and worked with Rolf Harris and then Wally Whyton on children’s television in addition to his collaborations with Postgate. Postgate, who died in 2008 in Broadstairs, is the more intriguing figure of the two, whose voice is engraved on my memory. He was the son of radical historian Raymond Postgate and Daisy Lansbury, the grandson of Labour party leader George Lansbury and classicist John Percival Postgate and great grandson of surgeon and food campaigner John Postgate, His aunt, Margaret Cole, was a Fabian politician and social campaigner, whose husband G.D.F. Cole cowrote The Common People, 1746–1946 (1946) with Raymond Postgate. Postgate was a conscientious objector and anti-nuclear campaigner, and the last episode of The Clanger was broadcast on the eve of the October 1974 election, satirising the political process at the time. (There used to be a blog of Postgate’s thoughts on the Iraq war – I have been unable to relocate this). It should be no surprise that a Malcolm Hulke-scripted episode of Doctor Who features the Master watching an episode of The Clangers. The Clangers is a product of a different era. An innocent era, one might say, but only on the surface (Rolf Harris?). The Postgate and Firmin animations have a charm that I think stays the right side of whimsey, there is an inevitable slowness to them that would be closer to, say, the first of the Wallace and Gromit stop motion animations than the latest Shaun the Sheep. And for whatever reason, I find the Clangers (and the inhabitants of the Magic Garden), realer than most CGI. There were only twenty-seven episodes of The Clangers ever made – and my heart sank when I heard there would be a remake. I’d shuddered at the Nigel Planer-voiced The Magic Roundabouts that Danot had made after Eric Thompson stopped (Mr MacHenry is not Scottish – know your canon), gave up partway through the Dougal movie and couldn’t bring myself to watch the new cartoons (apparently the line “‘Time for Bed,’ said Zebedee” was nixed because the audience might not be going to bed when they watched the episodes). I am scared. But NuClangers has the involvement of Daniel Postgate, and I am sure he would want to honour the spirit of his father’s work. The Solar Eclipse episode was reassuring https://www.youtube.com/watch?v=EsAyyOKoTik but when I get to watching the new episodes, on iPlayer I suspect, I will feel a little trepidation. Incidentally, a number of Postgate/Firmin puppets are on show at Canterbury Heritage Museum, but note that outside of Easter to September it is only opening during school holidays. There is also Postgate’s Becket frieze.